There is no feeling of licking, it is the quality as expected. The price is reasonable, too. This review is about item#25648754. I am using it for repairing the machine. The tip of the hexagonal wrench is not a spherical shape, it is flat, and the dimensional accuracy is sufficient. It can be used with confidence without damaging the hexagon bolt. This review is about item#7131065. 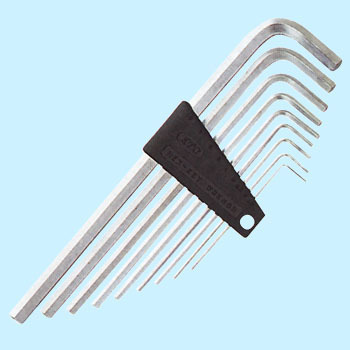 The L type wrench is mostly long rounded mostly, but when solving a hard screw, in particular with small screws it will have trouble to slip, but both wrenches are corners so the innermost wrench You can definitely preach the screws etc, and it is useful. This review is about item#07131065. I knew that the product quality was good, so I chose it without hesitation. The thing of the ball point does not enter neatly properly, or even if it enters, it does not use torque because it is hard to get on (head licking). It was saved because goods arrived early. This review is about item#07131074. At the ball point, you can loosen the screws that are tightened enough to lick screws, so it is very handy. It is optimum for performing full-scale tightening work and loosening work.